The colors in this picture were exaggerated or stretched to enhance the difference between the rock dubbed Stone Mountain and its collection of granular dots. A behind-the-scenes look at how NASA collects images from millions of miles away. (CNN) -- The Mars rover Opportunity has moved to the lip of the crater in which it landed and peeked out over the rim, mission scientists say. An image taken from that location shows part of the lander's shell and its parachute lying off in the distance across a flat, empty plain. The rover has been using onboard instruments to study a rock outcropping near the edge of the crater. 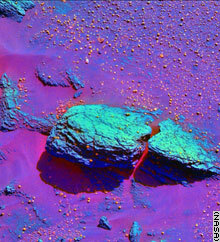 It first focused on a rock that has been nick-named Stone Mountain, and took microscopic images of its surface. Mission scientists plan to study other rocks in the outcropping in a similar fashion over the next few days. They are particularly interested in small "spheroids" embedded in the rock. Initial analysis indicates the rock has a high composition of sulfur, but principal investigator Steve Squyres said it is to early to say what that means. On the other side of Mars, the rover Spirit used its "rock abrasion tool," or RAT, over the weekend to bore 2 to 3 millimeters into the rock nicknamed Adirondack to study its mineral composition. Initial analysis confirmed an earlier theory the rock is volcanic in origin. That rover has now started a slow trek to a nearby crater called Bonneville. Opportunity is situated in an area of Mars called Meridiani Planum. It landed there just over two weeks ago and began sending back images showing exposed bedrock in the vicinity -- scientific paydirt for scientists who have likened Opportunity and its twin, Spirit, to robotic geologists. The rovers' mission is to study rocks and soil in an effort to determine whether the cold, desert world was once a warm, wet planet. Spirit landed on Mars just over a month ago and has been exploring an area on the other side of the planet called the Gusev Crater. It successfully rolled off its lander this month, but was plagued with onboard computer malfunctions that for a time threatened to end its mission prematurely. Mission controllers say it is now functioning normally. Both rovers are equipped with eight cameras that are providing stunning panoramas of the Martian surface, with resolutions so sharp they retain crisp detail when blown up to the size of a movie screen. Their microscopes, spectrometers and drills could unlock geologic secrets from billions of years ago, when, scientists think, the planet may have had conditions more suitable for Earth-like life.